Paddy Chayefsky’s character, Howard Beale, wasn’t the first protagonist to kvetch about dopamine-induced madness. Satirists have been lampooning DIMwits for centuries. Swift wrote about Liilput’s fear addicts, Dickens staged a dopamine intervention on money addict Ebeneezer Scrooge, Wilde shone a light on Victorian England’s esteem addicts, Orwell predicted what could happen if diseased power addicts continued to destroy and conquer. As each of these writers turned reality on its head to skewer the buffoonery, insanity, and inhumanity that riled them, they somehow ended up exposing and diagnosing dopamine-induced madness — long before there was brain scanning equipment to reveal how the brain disease they were writing about worked. All incisive social critique is really an exposé on dopamine addicts running amuck in diseased societies. When the censors stopped Rod Serling from featuring bigotry, xenophobia, and general stupidity during prime time, he wove his insights into Twilight Zone vignettes and the first Planet of the Apes film. Gene Roddenberry created Star Trek and planted his dopamine addicts in outer space. Theodor Geisel, writing as Dr. Seuss, filled children’s books with simpleminded caricatures who had about as much insight into their diseased behaviors as the manipulative pigs in Mr. Orwell’s Animal Farm. Then there was Hans Christian Andersen’s wonderful tale, The Emperor’s New Clothes — a story that’s been read by countless clueless adults who believed Andersen was writing about other people’s foolishness. By playing the self-deceptive game of “look at those dummies,” generations of well-meaning grown-ups squandered valuable opportunities to help themselves, and the children they were influencing, gain invaluable insights into how afraid we all are to be the first to speak up about absurdities most prefer to ignore. There’s an important difference between yesteryears’ satirists and today’s researchers. Modern brain scanning equipment makes it possible to get past the satirizing, critiquing, and complaining. 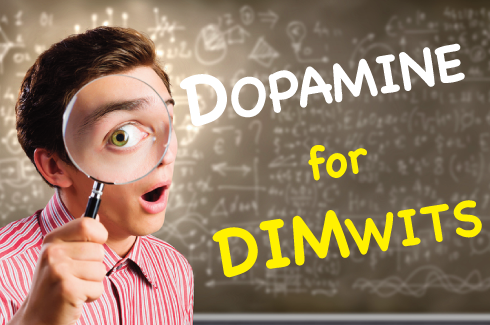 For the first time in history, scientists can explain how dopamine-induced madness and addictions keep just about everyone behaving like self-deceptive buffoons who never seem to figure out we’re the ones being satirized. I submit for your approval. It could take fifty years for the first group of influential DIMwits to acknowledge that DIM exists, a second fifty to convince the masses something ought be done, and fifty more to seriously attempt to do it. We don’t have a century to address the mess. We might not have decades. The problem is dopamine-induced madness and addiction are so all pervasive they’ve reached pandemic proportion. So much so, highly intelligent scientists can’t understand how, why, and that they share a vested interest in not wanting to look into the possibility they’ve spent their lives earning degrees, titles, and positions in the hopes of being accepted into an exclusive club dedicated to keeping anyone from figuring out a brain disease has turned everyone into dopamine addicts. It would be interesting to invite scientists to view a Twilight Zone episode about brilliant researchers unconsciously colluding, consorting, and conniving to keep a layman from warning about a brain disease keeping everyone from wanting to know they’re suffering from a debilitating disease. My guess is that most, if not all, would discover everybody’s face but their own. You neglected to mention Voltaire, the greatest of them all! You need read no further to get a glimpse of human idiocy.